Many families think of cruising as an all-in-one vacation option that’s both affordable and fun. After all, you get three meals a day, onboard entertainment, and several stops at different islands or port cities for one low price. But, did you know you can pay for a cruise entirely with rewards points? It’s possible to do so if you plan early and pick up the right combination of rewards cards. Still, you’ll need to go about it the right way if you hope to maximize your efforts. Before you hatch a plan to cover a cruise with rewards, it’s important to know the best ways to go about it. Not only should you focus on certain types of rewards cards, but you should take advantage of all the free perks you can. Cards like the Barclays Arrival Plus World Elite MasterCard or Capital One Venture Rewards are ideal for cruises since you can redeem your points for any travel experience you want. Both cards also offer a signup bonus plus 2x points on all your purchases, making them good options for racking up points quickly. Some travel credit cards offer free trip cancellation/interruption insurance that will cover you if your cruise is canceled for reasons beyond your control. By using a card that provides this protection to pay for your cruise and airfare to the port, you may be able to justify not buying a travel insurance policy and pocketing the savings instead. If one signup bonus can help you pay for a cruise, why not two? If you both earned the signup bonus on the Capital One Venture Rewards card, for example, you’d have $1,000 in signup bonuses alone to use toward the cruise of your choice. As you plan out your rewards strategy, don’t forget that both spouses can earn signup bonuses on the same cards. While cards that offer flexible travel credit are a good option for a cruise, you can also pick out cards that let you book cruises through their portals. If you earn Chase Ultimate Rewards points, for example, you can book cruises with points and get 25 percent to 50 percent more travel depending on which premier travel credit card you have. The same is true with the Citi Premier card since you can book cruises directly with points via the Citi ThankYou travel portal. Finally, using points to cover cruises is easy if you have a card that earns American Express Membership Rewards. 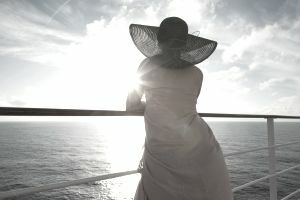 You can shop for cruises directly through AmexTravel.com and use points to cover all or part of the expense. While there are plenty of ways to get the most out of your points and efforts when booking a cruise, there are strategies that can hold you back as well. Some travel credit cards are cruise-specific, meaning they are co-branded with a bank and a cruise line and marketed as a way to earn cruise discounts or added perks. The Carnival World MasterCard is probably the most popular card in this niche, and frequent cruisers may be inclined to sign up for it if they don’t know any better. When you break down what this card really offers, however, it’s easy to see why it’s not worth pursuing. Not only does it offer just 10,000 points worth $100 as a signup bonus, but you only earn 1 “FunPoint” per $1 spent on all other purchases. In essence, those facts make this a 1 percent cash-back card with a $100 bonus and nothing more. The worst part, however, is the fact you can only redeem your points for credits toward Carnival cruises. So, if you decided to go with another cruise line, you’d be out of luck. If you’re tempted to get a credit card marketed by a cruise line, remember that you’d be a lot better off picking up a cash-back card instead. There are several that offer 2 percent cash-back or more with no annual fee. Another way to miss out on rewards is by sticking with a regular 1 percent cash-back card and forgetting to sign up for one that offers more rewards. If you’re only earning 1 percent back on your card, consider a card like the Citi Double Cash. This card doesn’t charge an annual fee yet it offers a flat 2 percent back for each dollar you spend—1 percent when you make a purchase and another 1 percent when you pay it off. Also, consider the Discover it Miles for cruises. While this card offers only 1.5 “Miles” for each dollar you spend, Discover promises to double your rewards after the first year. When you factor that in, this card doles out 3 percent for the first 12 months with no annual fee. Plus, you can redeem points with this card for any cruise or travel purchase you want.